A Kentucky Senate committee has just approved a bill that would require women seeking an abortion to be shown an ultrasound first. This is roughly the one millionth time Kentucky Republicans have tried to pass this piece of legislation, but this year, they might actually succeed, because Kentucky Democrats aren’t working particularly hard to block them. Senate Bill 152, which you can read in full here, passed through a Senate subcommittee Thursday; it requires a doctor to perform an ultrasound and describe the “unborn child” to the pregnant person. Doctors who don’t comply face fines of up to $100,000 for a first infraction and $250,000 every time thereafter; they could also face sanctions from Kentucky’s Board of Medical Licensure. It does, however, generously include a provision allowing the patient to avert her eyes, saying she can’t be forced to look at an ultrasound and won’t be penalized if she refuses. Very big of you, Kentucky. The forced ultrasound bill is introduced by some enterprising anti-abortion state senator each and every year, but generally dies when it reaches the House. This year, though, could go differently: Kentucky just passed and signed into law another anti-abortion bill that usually fails, an “informed consent” provision requiring abortion-seeking people to have in-person counseling 24 hours before obtaining an abortion. It is, as McClatchy points out, the first anti-abortion bill to pass in Kentucky in 12 years. 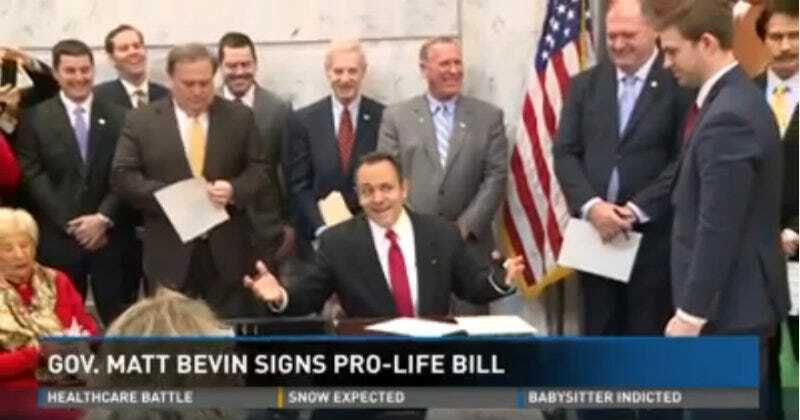 It was the first bill Matt Bevin signed into law as governor, and he signed it during a party on the statehouse steps organized by Kentucky Right to Life. The informed consent law passed, according to the Kentucky Herald-Leader, because state Democrats are feeling “politically defensive” as their numbers shrink. Instead of fighting the bill, they merely fought to add a provision allowing the counseling to happen via video chat. Kentucky only has two abortion clinics, EMW Women’s Surgical Center, which has one location each in Louisville and Lexington. The state also still has a law on the books requiring “spousal notification,” a 1982 provision that requires husbands to be informed within 30 days if their wives have an abortion. It’s not clear whether that one is ever enforced, but it remains a Class D felony if the doctor “intentionally, knowingly, or recklessly,” fails to comply, punishable by between one and five years in prison. Bevin signing the informed consent provision; screenshot via WHAS.